2014: Meanwhile, Back at "The Home"
Sandy is still on vacation, so I relieved a woman named Ann today. We talked a bit and then she bought two books, one of old Russian folk tales with some beautiful woodcuts for illustration, and another book about Navajo rugs. We agreed that working at Logos was very dangerous for book folk. I was tech-less at the store today, having forgotten my cell phone. Not only that, but the built-in clock for the charge machine was off by 45 minutes, so every time I wanted to see what time it was (until I remembered there is a cell phone in the desk), I had to calculate what time it was, based on what the clock was showing. There were five people browsing around the shop when Ann left, none of whom bought anything. Even Bruce, who showed up in his usual white baggy threadbare attire, hatless this time, didn't buy anything, though he did say hello. Three women stood in line at the bookcase, one standing, one kneeling and one hunkering. They all wore jeans, had long brown hair and t-shirts. One bought a sci fi book and one bought a fantasy book. A guy wearing a Breakfast Club shirt bought "Fahrenheit 451,""The Once and Future King" and "The Picture of Dorian Gray." I commented on his shirt and what a good movie it was. He looked confused and said he'd never seen it. 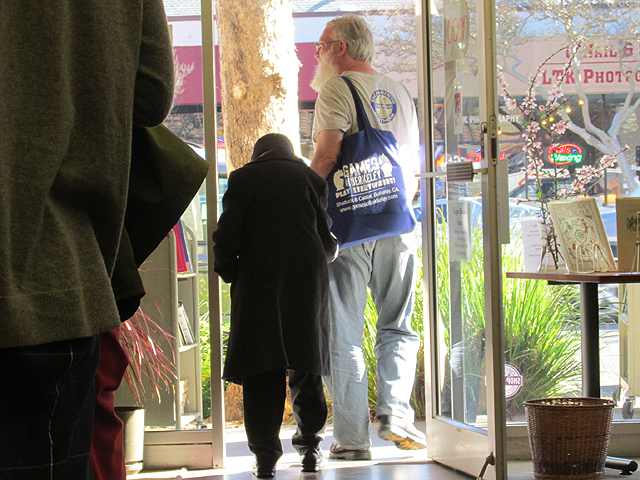 An old guy with that knees-bent, foot shuffle old folks often have (me included) had an arm full of bargain books. As he walked around the store, I noticed that the outside of his right shoe was worn down, though the other shoe was fine. 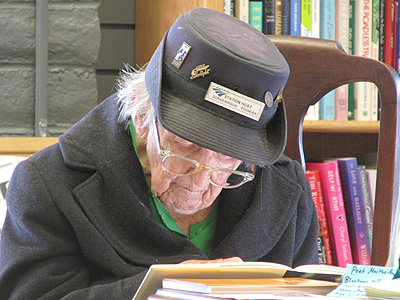 He led the woman to a bookcase and said "Here are the books you like -- train books." He then picked out a book for her and led her to the table in the front, where she sat while he browsed the store. She was wearing a hat that looked like it was some sort of a uniform. 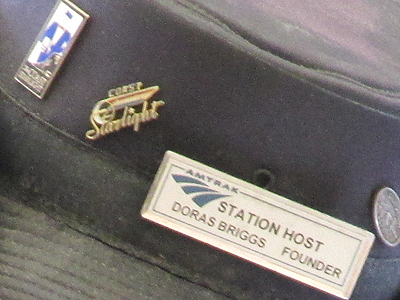 Is the legendary Doras Briggs who started the station host program still putting in appearances at Emeryville? Last time I saw her she looked pretty frail, not too unusual for a woman in her nineties of course, but considerably more frail than on previous occasions. 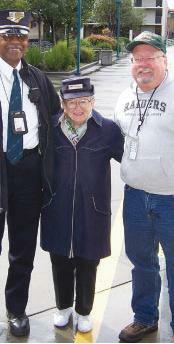 The Station Host Association of California is looking for volunteers to provide friendly assistance to train passengers at our Host Stations in Emeryville, Oakland, Martinez, Sacramento, Davis, Merced, Hanford, San Luis Obispo, Fresno, San Jose, San Francisco and future sites at Stockton and Salinas. One of the things I love about this job is stuff like this, and being able to look things up on the internet. When the guy came to buy a book about trains, I noticed that he was wearing a t-shirt from the train museum in Old Sacramento and I asked if he worked there and he said that no, but his grandmother had worked for Amtrak and that the two of them were there every day. Now I know why. After that, the day was pretty boring. David Breaux, the Compassion Guy walked by. He didn't come in, but it made me think of the fact that he had been taking a trip across the country preaching compassion (the feeling, not the child sponsorship organization). I made a note to be sure to mention it to Kari Peterson, his friend. David stood on a corner in front of AT&T here in Davis for about a year and interviewed people about what "compassion" meant to them. 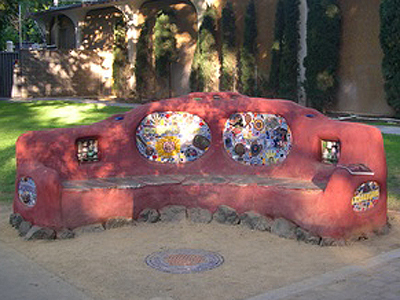 He eventually published a book of the answers people gave, and he got permission from AT&T to build a "compassion bench" on their property, designed by several local artists. (Check the link to see details of the bench.) It is an "earthbench," he explains, and a monument to compassion. Earthbenches are the creation of Brennan Blazer Bird, a Davis resident who seeks to build 1,000 benches worldwide through the Peace on Earthbench Movement, POEM (earthbench.org). Earthbenches are made of bottle bricks (plastic bottles packed with non-organic waste), cobb (dirt, clay, straw and water) and plaster. Bird and Breaux collaborated with local ceramic artist Mark Rivera, who helped volunteers design tiles that were then placed around the bench and which, like the book, express various and diverse ideas about compassion. The rest of my day was pretty much the same as every other day, but these two events definitely were the highlight. "My friend" came in an hour early and bought four books, saying he had to get out of there before he was tempted more. Walt came at 6, followed a minute or two later by Peter, and my day was finished. Next Thursday will be my last day to work at Logos with all of my hair, as I will be shaved right after I finish working.